How can we ease the burden of shopping for older people? How often do we stop and think about the range of everyday tasks that must be done to get a meal onto our plate? From planning what to buy, getting to the shops, navigating around a store, making sure we have the means to pay, packing food into bags, getting heavy bags home, packing food into cupboards and fridges, cooking and preparing food – it is a long list. But they are not part of everyone’s daily routine. Some people struggle to access food because they do not have enough money and food banks support an increasing number of people who would otherwise go hungry. 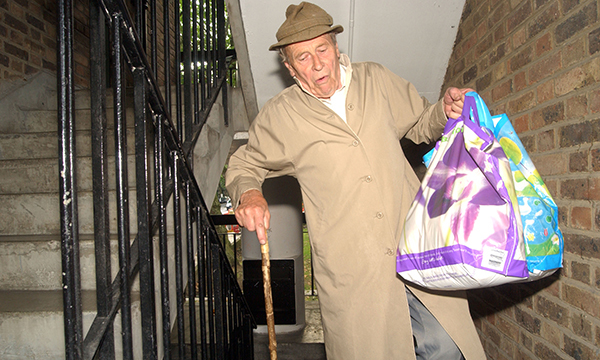 Older people often find it difficult to access safe and nutritious food too. As researchers at the University of Hertfordshire, we have been working to explore this issue. We found that older people want to stay in control of their shopping, in part because outings to food stores provide opportunities for exercise and, in some cases, social interaction with other people. However, older people face a number of factors that limit their ability to be independent. These include health problems, mobility issues, poor cooking skills and lack of access to transportation. They also include a lack of facilities, such as parking bays or clean and accessible toilets at supermarkets. These problems are incremental, whereby several small challenges can build up and stop older people from being able to access food easily. Services such as lunch clubs and meals on wheels are important because they enable some older people to live independently in their own homes. However, these services are under threat because of a loss of funding. There is much that could be done to better support older people – often at minimal financial cost – and we can all be involved in driving change. Supermarkets could become more inclusive by providing seating in stores, and giving people the time and assistance that they need. As individuals, we can offer to help people reach products on high or low shelves, or talk to older shoppers – if you do this, you could be the only person the person you help has spoken to that day or even week. Hospital nurses could check if someone needs support to access food when they are discharged from hospital. They might need help with shopping, even on a temporary basis. Community nurses could check if people are managing to access food, ensure that they have food in their home or refer them to support services. Much needs to be done across society, after all, 11.6 million older people in the UK are malnourished (Malnutrition Task Force 2017). To help health and social care staff think about how they can support older people’s nutrition and access to food, we have developed a short film, which you can view here. We have also devised an educational board game, the Food in Later Life Game, that encourages people to discuss and consider the practical things they can do to help. The Food in Later Life Game, developed with educational board games specialists Focus Games, challenges us to engage with the experiences of older people and think of possible solutions that could make a difference to people’s lives. The game is designed to be played in formal and informal education settings by health and social care staff and students. It is a fun and engaging way to learn. It is already being used by university nursing students, dietetic teams, community groups and older people themselves. After playing the game one student commented: ‘The game was educational and an eye-opener about what goes on around us. It makes me think about what is in the future for me, my parents and what my grandparents may be experiencing now. A dietitian commented: ‘The Food in Later Life Game is great at getting people to think about food insecurity in later life and the barriers to eating well that can increase the risk of malnutrition.